It’s equally at home at the office or gym — and especially great as you cycle from place to place. What I first noticed when the review bag came in the mail was how light it was. 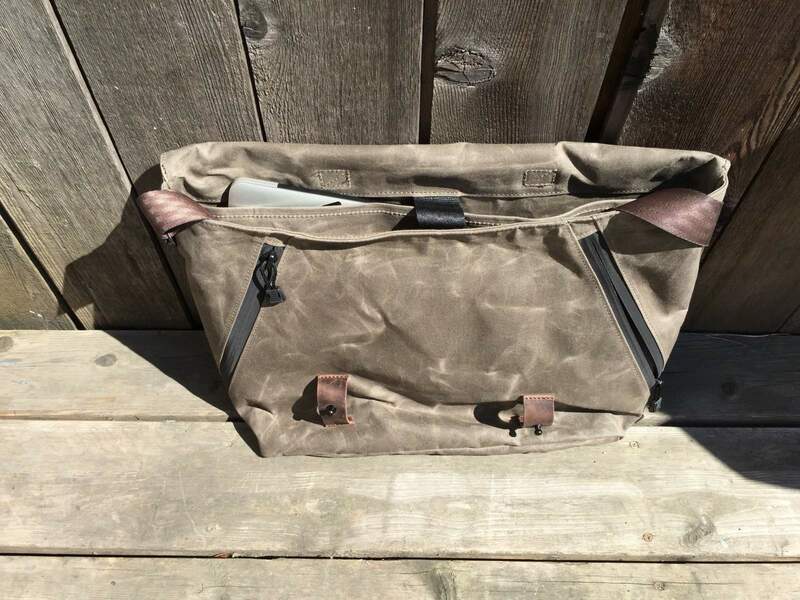 There’s a ton of functionality in this messenger with very little extra material. There are three useable smaller pockets on the inside, and they’re just great for holding my headphones, MacBook Pro power supply and any number of smaller objects like sunglasses or notepads. The opposite sidewall has the obligatory laptop enclosure, though you’ll want some sort of padded sleeve if you need to protect your MacBook from bumps during your commute, as there’s no padding in this thing. The main storage area is voluminous, too, which will let you put in gym shoes, towels, changes of clothes or a ton of gear (and smaller organizing bags like Waterfield’s own Gear Pouches). The Vitesse will hold a ton of stuff securely, thanks to the clever-yet-classy leather straps that pop down onto metal studs in front. The design of these things is delightful: Simply place your thumb under the metal stud, conveniently arranged on its own leather loop stitched into the front of the bag, then slide the leather closing strap with a soft, audible popping sound, either on the first or second holes provided. To release, it’s a simple tug on the closure strap and you’re in. Lots of extra space without a lot of extra material to weigh you down. Adding even more functionality is the Vitesse’s bag-spanning front pocket that’s protected by waterproof zippers on either side. Zip one open while the bag is on your body and you can instantly access the entire front pocket. There’s even a nice lined pouch in there that can hold iPhones, papers, keys or anything smaller that needs to stay safe and protected away from any bottom pocket clutter. You can do all of that without ever opening the messenger bag’s main flap — a boon to anyone traveling on foot or bicycle. The seatbelt-style nylon strap is adjustable to get your bag safely secured to your back while cycling, and WaterField also provides an optional stabilizer strap to keep things from sliding around during your ride. The shoulder strap is a bit on the no-frills side, and could benefit from an optional padded attachment for when you’ve filled the messenger bag to the brim with heavy tech. 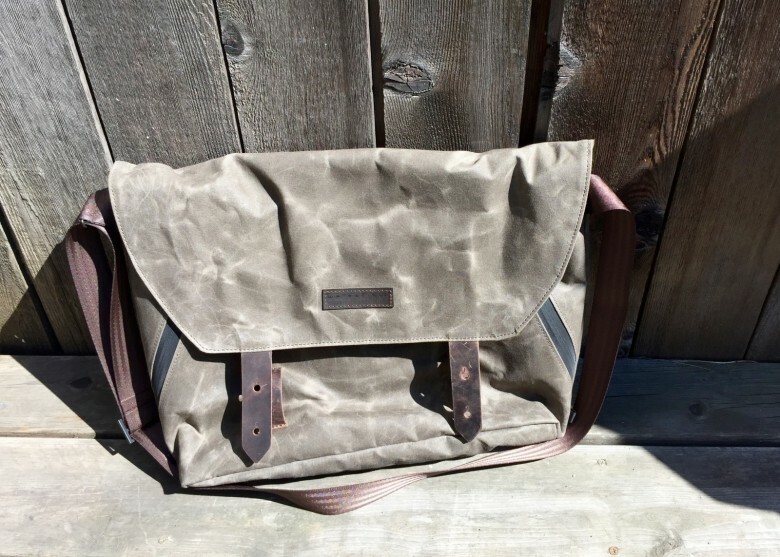 You can grab your own Vitesse messenger bag in brown, burgundy or navy waxed canvas for a thrifty $159, with the added stabilizer strap coming in at an extra $10. If you’re looking for something that can keep your stuff together no matter what you need contained, this is one of the better buys out there. And you’ll look great doing it.